Today marks World Osteoporosis Day, which is a day near and dear to my heart. Ever since witnessing the debilitating impact this disease had on my own grandmother, who actually fractured her back from just coughing, I have been determined to learn more about how to prevent osteoporosis. If you had asked me before I became a dietitian what I thought was the most important factor in maintaining strong bones, I would have told you a diet rich in calcium. However, the research now shows that many more factors can play a role in improving bone density. 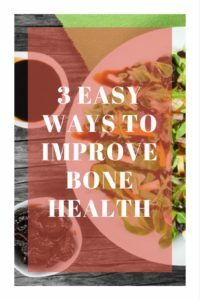 And you may be surprised to learn just how simple it can be to boost bone health. This post has been sponsored by Sunsweet. All opinions are my own. World Osteoporosis Day is celebrated each year on October 20th to take notice of ways to prevent osteoporosis, which affects 1 in 3 women and 1 in 5 men over the age of 50. Since much of our bone density is developed in childhood and adolescence, focusing on bone health at any age is critical in preventing low bone density later in life. Luckily, helping to fight osteoporosis can be easy and delicious. Research suggests that eating just 5-6 prunes each day may help to prevent bone loss. Could it get any easier? 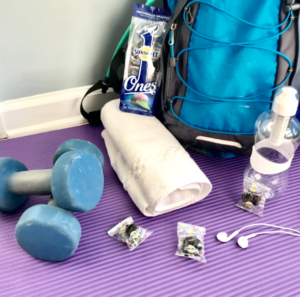 Prunes are such a portable, convenient snack and you can enjoy them any time of day. 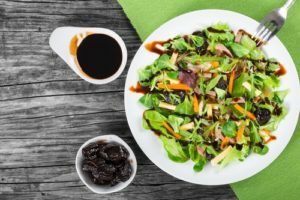 Toss a few prunes into your favorite trail mix, add them on top of your salad, or even sprinkle them on top of your yogurt. However you do it, just make sure to enjoy at least five to six per day to benefit your bones (according to the latest research). Strength training exercises not only help to build metabolism boosting muscle mass, but they can benefit bone mass as well. One study found that performing squats three times per week led to an increase in bone mineral content in post-menopausal women who had already been diagnosed with osteopenia and osteoporosis. The best part about squats is that you don’t need any special equipment to do them. Your own body weight serves as enough resistance without adding additional to improve strength, muscle mass, and improve bone health. To get started, perform three sets of 8 to 10 reps three times per week. As your strength increases over time, you may add additional weight by holding light dumbbells at your side. Before you start squatting, just make sure to get clearance from your physician that this form of resistance training is safe for you. If you know me, you know I hate crash diets. They accomplish nothing except causing you to feel hungry, miserable, and mess up your metabolism. If that wasn’t bad enough, they may have a negative impact on bone health as well. One study of obese women found that following a 925 calorie per day diet for four months led to a significant loss of bone density regardless or whether they performed resistance exercises or not. Imagine practically starving yourself for four months, hitting the weights at the gym, and actually increasing your disease risk in the process?! Don’t crash diet. 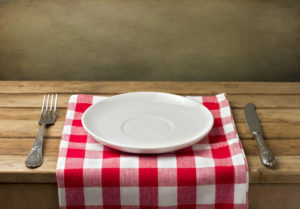 Don’t starve yourself! If you want to lose weight, focus on increasing fiber to add volume to your meal plan with fewer calories, but never eat less than 1200 calories per day. Eat a balanced meal plan that includes a mix of lean proteins, healthy fats, whole grains and aim to fill your plate half way with fruits and vegetables at each meal (including prunes! ).